One thing that sur­prised me when work­ing on How Many Neu­rons Are There was the num­ber of neu­rons in the brains of very small an­i­mals. Let’s look a clas­sic mea­sure­ment, the brain-mass:body-mass ra­tio. * Smarter an­i­mals gen­er­ally have larger brain sizes for their body mass, com­pared to an­i­mals of similar size. Among large an­i­mals, hu­mans have fa­mously enor­mous brains for our size – the high­est of any large an­i­mal, it seems. But as we look at smaller an­i­mals, that ra­tio goes up again. A mouse has a com­pa­rable brain:body-mass ra­tio to a hu­man. Get­ting even smaller, in­sects have higher brain:body-mass ra­tios than any ver­te­brate we know of: more like 1 in 6. And the trend is also roughly true for neu­ron-county:body-mass. Hu­mans do have un­usu­ally high num­bers of neu­rons per kilo­gram than other an­i­mals, but far, far fewer than, for in­stance, a small fish or an ant. …then this ex­pla­na­tion is an in­di­ca­tion that in­sects and other small an­i­mals have much more moral worth than their small size sug­gests. Imag­ine, if you will, a stan­dard 5-gal­lon plas­tic bucket. 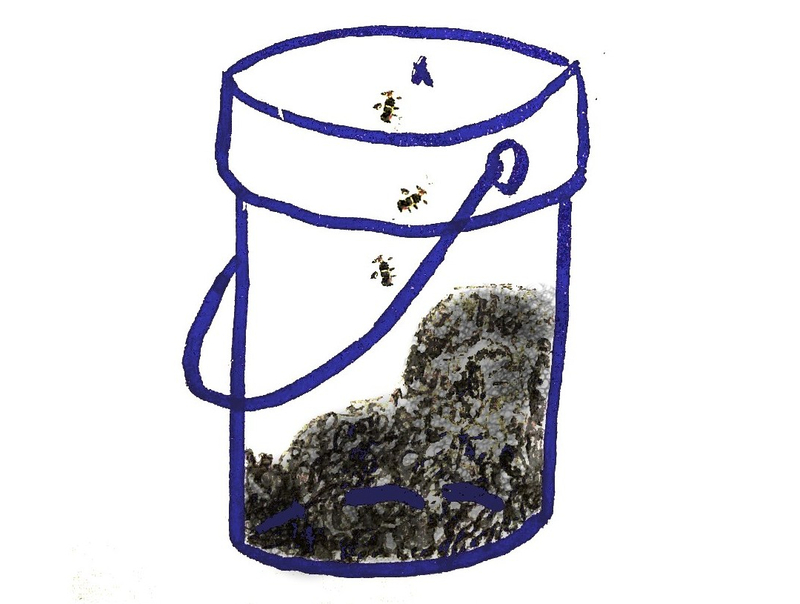 Now imag­ine that bucket con­tains 300,000 ants – about two pounds. *** Or a kilo­gram, if you pre­fer. 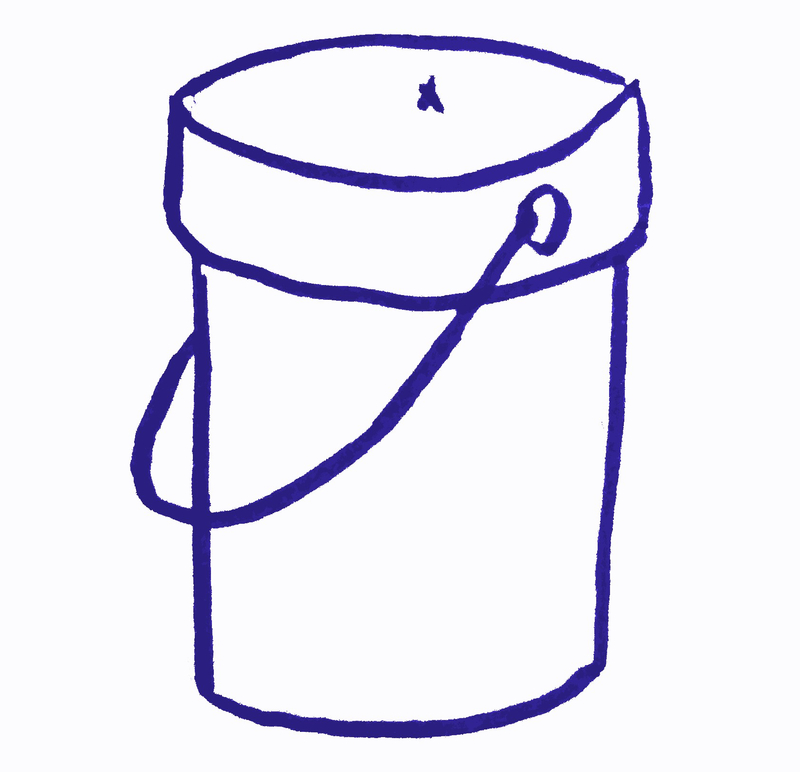 Imag­ine the bucket. Imag­ine the equiv­a­lent of a cou­ple large ap­ples in­side it. Those ants, col­lec­tively, have as many neu­rons as you do. You may no­tice that an adult hu­man brain ac­tu­ally weighs more than two pounds. What’s go­ing on? Sim­ply, in­sect brains are mar­vels of mi­ni­a­tur­iza­tion. Their brains have a panoply of space-sav­ing tricks, and the phys­i­cal cells are much smaller. *Aren’t the cool kids us­ing cephal­iza­tion quo­tients rather than brain-mass:body-mass ra­tios? Yes, when it comes to mea­sure­ments of higher cog­ni­tion in ver­te­brates, cephal­iza­tion is (as far as I’m aware) thought of as bet­ter. But there’s de­bate about that too. Refer­ring to abil­ities di­rectly prob­a­bly makes sense for as­sess­ing abil­ities. I don’t know much about this and it’s not the fo­cus of this piece, any­way. **Yes, I know that only the first ques­tion is di­rectly rele­vant to this piece, and that all of the oth­ers are differ­ent. I’m just say­ing it’s ev­i­dence. 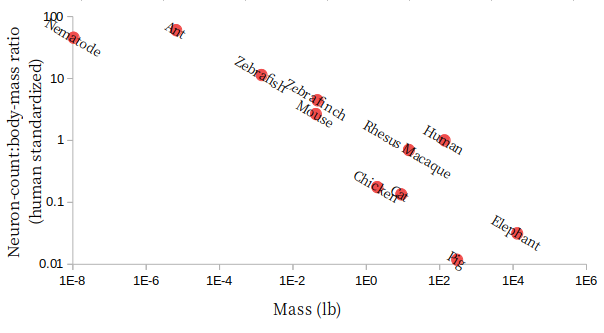 We don’t have a lot of be­hav­ioral data on small an­i­mals any­ways, but I think we can agree there’s prob­a­bly a cor­re­la­tion be­tween brain size and cog­ni­tive ca­pac­ity. 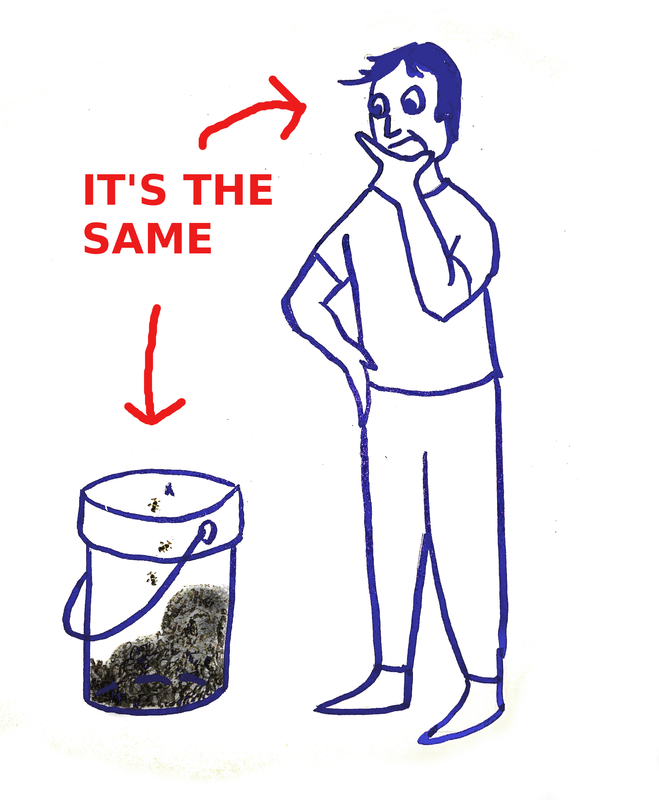 ***Do two pounds of “nor­mal-sized” ants ac­tu­ally fit in a five-gal­lon bucket? Yes. I couldn’t find a num­ber for “ant-pack­ing den­sity” in the liter­a­ture, but thanks to the vali­ant efforts of David Man­heim and Rio Luma­pas, it seems to be be­tween 0.3 gal­lons (5 cups) and 5.5 gal­lons. It de­pends on size and whether ants pack more like spheres or more like blocks. This is fas­ci­nat­ing! I’ve heard (though it may well be bunk) that in­tel­li­gence in hu­mans is some­what cor­re­lated with brain size but that the brain size is limited by the size of the birth canal. (Which made me think that c-sec­tion should lead to smarter peo­ple in the long run.) But if there’s still so much room for op­ti­miza­tion left with­out chang­ing the brain size, does that merely in­di­cate that the changes would take too many mu­ta­tions to be likely to hap­pen (sort of why we still have our weird eye ar­chi­tec­ture when other an­i­mals have straight­for­ward eyes) or that a lot of hu­man think­ing hap­pens at a lower ab­strac­tion level than that of the neu­ron so that, e.g., whole brain em­u­la­tion at a neu­ronal level would be des­tined to fail? Upvoted! Thanks for the clear ar­gu­ment, de­scrip­tive ti­tle, and amus­ing car­toon. Ideally, good Fo­rum posts will also be mem­o­rable, so that peo­ple re­mem­ber them in fu­ture dis­cus­sions, and images are a good way to achieve this.